Pick(s) of the Week: American Vampire Anthology #1 and a Bunch More! 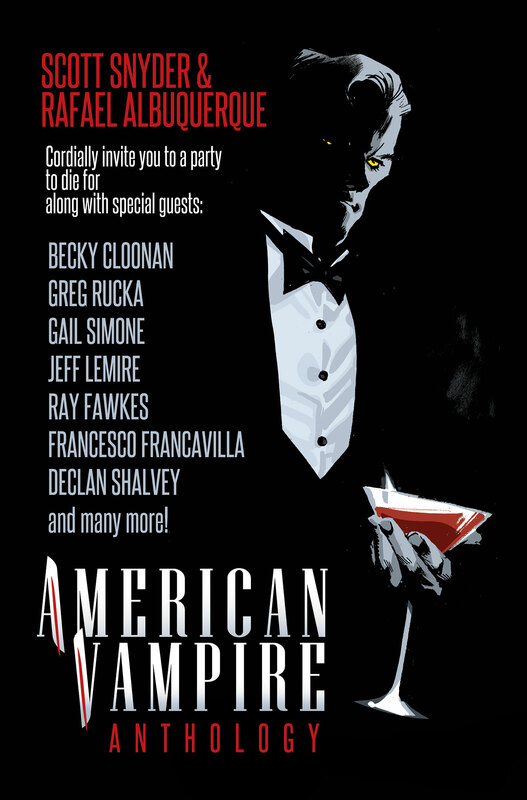 There’s a hell of a lot of solid comics out this week, but none fill a fix like American Vampire Anthology #1. American Vampire has been on hiatus for a bit while writer Scott Snyder releases some awesome other comics (*cough* The Wake *cough*). So, to get a chance to get a bit of the mythos, even as an anthology, is quite ok with us. This special features eight amazing stories set in the world of American Vampire, with “lost tales,” new characters and old favorites. So, don’t miss these stories brought to you by series creators Scott Snyder and Rafael Albuquerque, as well as other awesome comics talent like Becky Cloonan, Gabriel Ba and Fabio Moon, Jeff Lemire, Greg Rucka, Gail Simone and many more! You are cordially invited to a party—to die for! Catch our full list of picks below! Top Pick: King Conan: The Hour of the Dragon #4 (Dark Horse) – Conan claws his way from the depths to regain his throne. The inside is as good as the outside’s award-worthy cover art, trust me. Overtaken #1 (Aspen) – Most Aspen series, much to my dismay, have the same look and feel to me, but this newest one appears different from the rest. While the abducted loved one is a familiar story, I’m anxious to see their take on it. Uncanny #3 (Dynamite) – The god-awful cover aside, Andy Diggle’s thief-with-powers crime story is a great read, and it’s not too late to start from the beginning. Top Pick: American Vampire Anthology (Vertigo) – See above as to why I think this’ll be awesome and well worth the price tag. The Massive #15 (Dark Horse) – Brian Wood continues to knock it out of the park with each issue and somehow the series is only getting better. Occupy Comics #3 (Black Mask Studios) – Politics = comics = awesome. So much talent packed into one issue. Overtaken #1 (Aspen) – The $1 price tag should be enough of a reason to pick it up, but Aspen is giving us what seems to be an interesting story about possible abduction by aliens. Uncanny #3 (Dynamite) – Super powers + crime = this. The first two issues were intriguing and the third really starts to ramp up the storyline and give us an idea as to where it’s going next. Top Pick: American Vampire Anthology #1 (Vertigo) – I love this series and it’s been torture waiting for it to come back, but this anthology written and illustrated by an amazing list of creators should be a phenomenal way to ease back into the AV world. Lazarus #3 (Image) – After last month’s excellent world building issue, I can’t wait for this arc to pick up some steam. Plus, we get to meet another Lazarus, and the dynamic between he and Faith should be fascinating. Top Pick: Batman/Superman #3 (DC Comics) – This has been an incredible, confusing book so far. And, hot damn, what’s Wonder Woman doing?! Batman, Inc. Special #1 (DC Comics) – With the end of Grant Morrison’s famed and infamous run on Batman, it’s time to see where other writers will take these characters…including Bat-Cow! Larfleeze #3 (DC Comics) – Keith Giffen is one of my favorite writers, and Larfleeze is funny as hell. If you like Douglas Adams or funny sci-fi, you’ll want to check this out!